Coach Shuttle Buses & Executive Mini-Buses have a spacious and friendly layout with forward facing & perimeter seating with large viewing windows and rear storage. The ideal vehicle for your larger groups Vancouver Airport to Whistler transfer, Vancouver Tour or Corporate transfers and Employee Shuttle Services. Sprinter Vans & Luxury SUV’s feature spacious leather seating, privacy windows and great luggage storage. 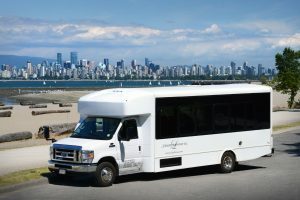 All our vehicles are new, spacious and perfect for small to large groups for transfers to Whistler, or Vancouver Tours and Corporate Site Tours. *Infant/child safety seats or booster seats are available upon request. Our drivers take pride in their professionalism and top quality service. Sophistication, service, and safety is our commitment.